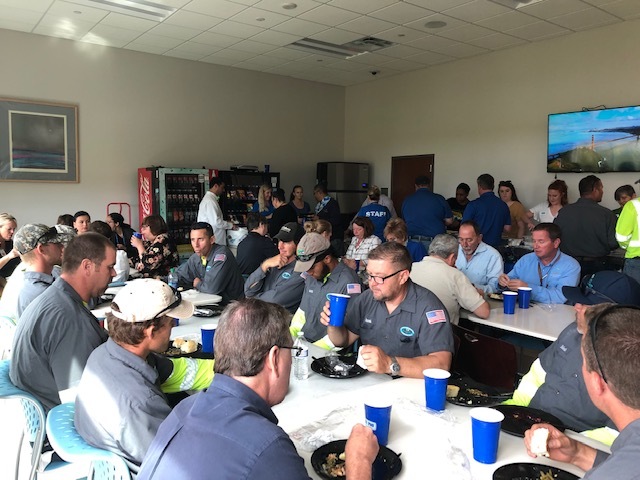 PALM COAST, FL – April 12, 2019 – Earlier this month, Waste Pro’s staff in Palm Coast, Florida spent three days honoring the hardworking employees for the City of Palm Coast by treating them to lunch. On April 3rd, Waste Pro’s team fed approximately 130 public works employees; the next day, the team provided lunch to 130 utility workers; on April 5th, Waste Pro traveled to City Hall to bring lunch to 140 employees. Each meal was delivered by Cracker Barrel and served by employees from Waste Pro’s Palm Coast and Jacksonville offices. In an effort to raise awareness about recycling and the harmful effects of single-use plastics on the environment, Waste Pro did not provide throw-away cups for the luncheons; instead, each city employee received their beverages in a reusable Waste Pro cup to take with them as a reminder that Waste Pro cares for our communities. “Caring for our communities is our motto, and we wanted to illustrate that by showing our appreciation for the city’s continued support as we service residents and businesses across the community every day,” said Palm Coast Division Manager Shea Drury. Waste Pro USA, Inc. is one of the country’s fastest growing privately-owned waste collection, recycling, processing and disposal companies, operating in nine southeastern states. Waste Pro, with revenues exceeding $700 million, serves more than two million residential and 40,000 commercial customers from over 75 operating locations. Waste Pro is headquartered in Longwood, Florida, and maintains more than 270 exclusive municipal contracts and franchises.